SkySwitch announced today that UCaaS and hosted PBX providers utilizing its platform-as-a-service solution are now able to offer their end users protection from robocalls. The new feature, available today, is a result of its integration with Nomorobo. Robocalls are computer-generated phone calls that play recorded messages when answered. Although robocalls can have a valid purpose, they are often used by scammers that spoof phone numbers to impersonate an organization to which a called party might be inclined to divulge sensitive or confidential information. The problem has grown so large that unwanted calls are the largest source of complaints to the FTC (up to 7.1 million in 2017 versus 5.3 million in 2016), and it is estimated that nearly one-half of all calls made are now originated by a computer. Nomorobo offers a specialized data service that allows telecom network operators to programmatically identify a potential robocall before it rings the end users phone. By integrating with the Nomorobo system, SkySwitch is able to alert business telephone users to the fact that a call is potentially from a telemarketer, and then let them choose how to handle it. 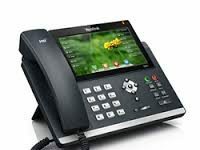 The system can be configured to answer the call, send it to voicemail, or just hang-up without disrupting users.